The company is over 50 years in business and is still owned and run by the McGrath Family. Quarrying started in the Cong area in the 1950’s due to the introduction of the subsidy for the haulage of Ground Limestone for agricultural purposes.Mr Michael McGrath Snr, father of the current owners, purchased the quarry in the early 60’s from the Glynn family on an area of about 7 acres. The quarry has grown today to approximately 180 acres. Michael McGrath Snr produced only Limestone from the quarry up until his sudden death in 1970 at the age of 49. 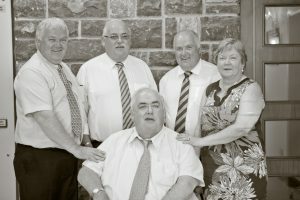 His wife Mary McGrath ran the business for a period of three years until Michael and John Joe took over its running which continues to this present day. Mr Michael McGrath Snr, father of the current owners, purchased the quarry in the early 60’s from the Glynn family on an area of about 7 acres. The quarry has grown today to approximately 180 acres. Michael McGrath Snr produced only Limestone from the quarry up until his sudden death in 1970 at the age of 49. 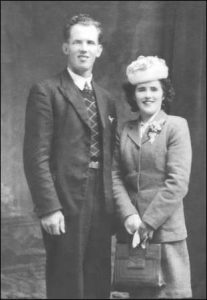 His wife Mary McGrath ran the business for a period of three years until Michael and John Joe took over its running which continues to this present day. The business has expanded and grown every since, firstly it extended to the manufacturing of stone and aggregates for the building trade and local County Councils. In 1982 the company began producing ready mix concrete and concrete blocks and in 1995 saw the quarry exporting Weathered Limestone Rockery stone to mainland England where it is widely used by gardening centres and local authorities for landscaping purposes. Again in 1998 saw the quarry expanding as McGraths purchased a modern Asphalt Manufacturing Plant. Production, contract laying and civil engineering projects are all now a feature of McGraths Limestone Works. In more recent times the company again further expanded by installing a state-of-the-art limestone fines Filler Plant for the production of calcium carbonates. The quarry has remained a family affair with four sons and one daughter of the late Michael McGrath snr and five grandchildren now working in the business. The quarry still produces Ground Limestone and has continued to produce it for the last fifty years. It currently produces 500,000 tons annually with a range of 50 products.